Hi there! 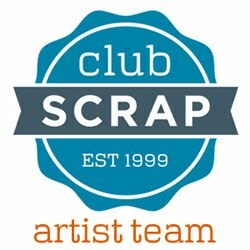 Well here we are for another Club Scrap Artist Team Challenge! 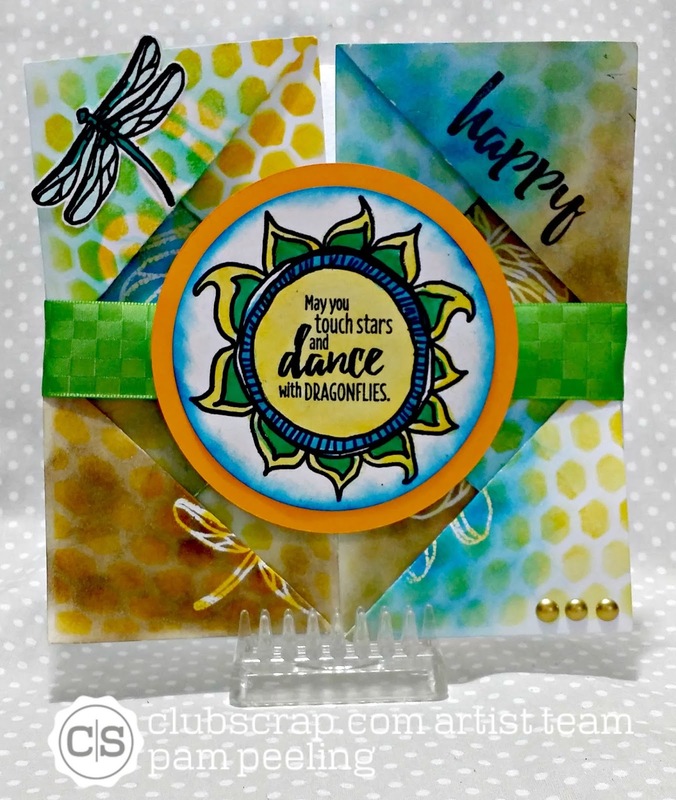 This month's Club Scrap kit is called Color Me Happy and boy did it make me HAPPY! 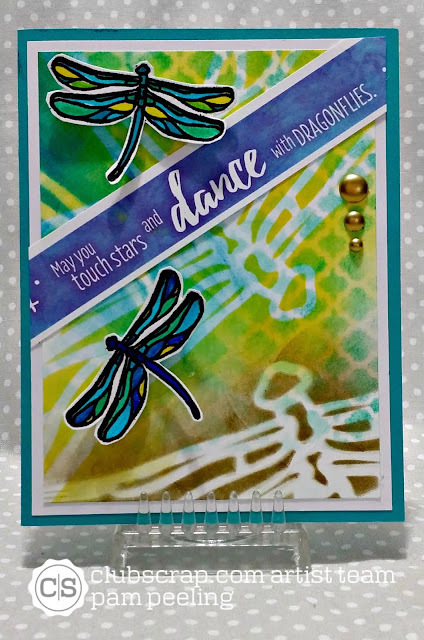 Such a beautiful kit with great colors and dragonflies! AHHH love them! 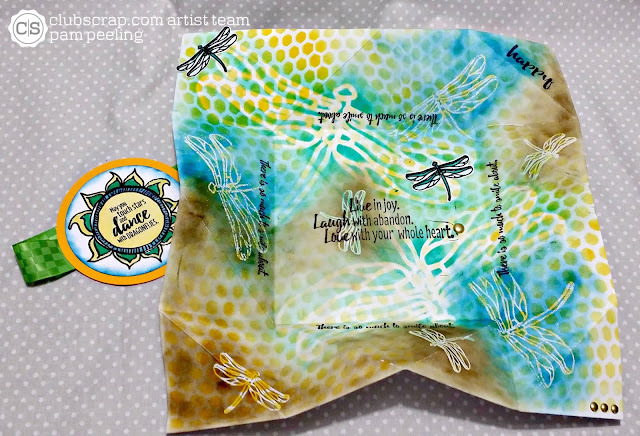 :) If you've followed along the hop you should have just come from the amazing Roni's Blog. 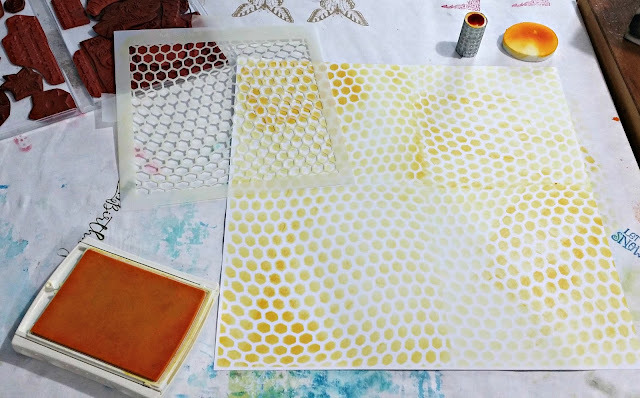 This month we were tasked with creating something using a batik/faux batik technique since this kit is inspired by well...batik! Perfect! 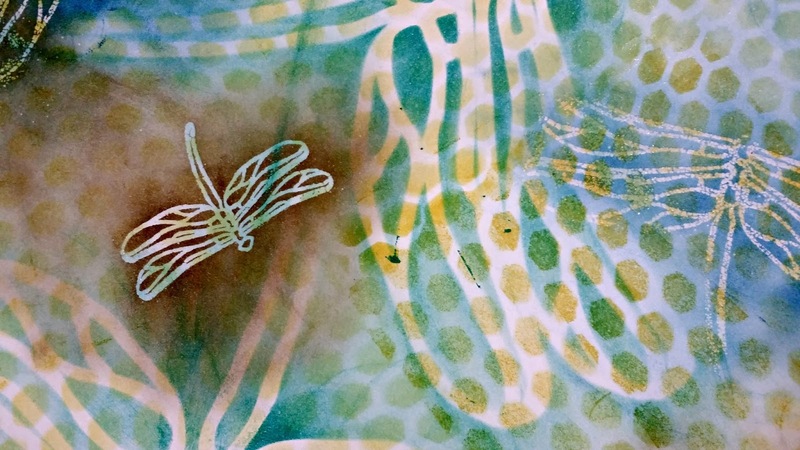 Now I'll be honest-I had a few failed attempts at creating some batik designs that were usable. BUT I tried again and I'm glad I did! I started with a 12 x 12" piece of white cardstock. 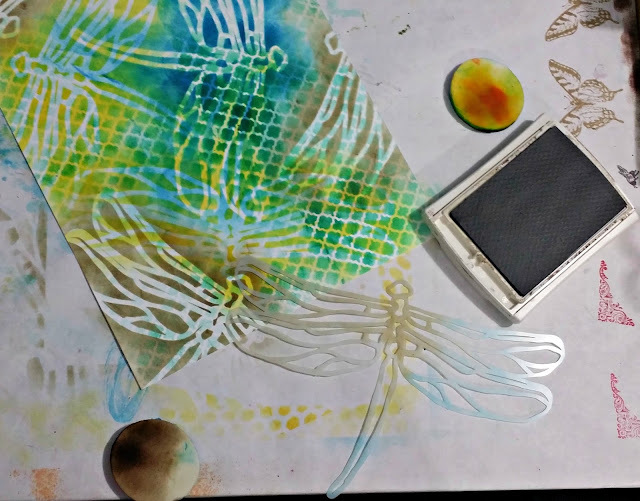 I used a mask from a prior kit and applied color from an ink pad with a makeup sponge. I dabbed and wiped and rubbed to get the look I wanted, I wanted it heavier in some areas than others. I just kept moving the stencil to cover the whole sheet. 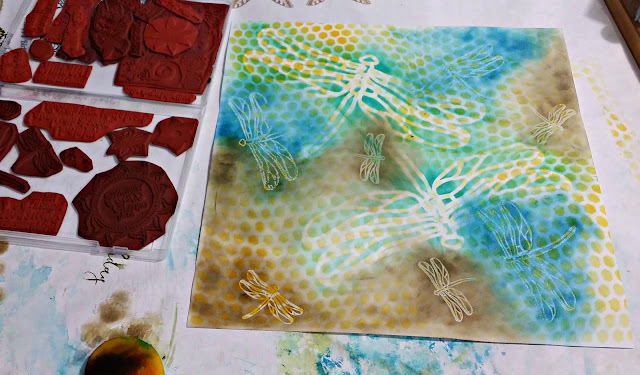 Then I used the dragonfly mask that came with the Color Me Happy kit and rubbed on different colors over and around that. Then I stamped the smaller dragonfly images with clear versamark ink and applied clear embossing powder. I heated it and then rubbed on more colors over them. 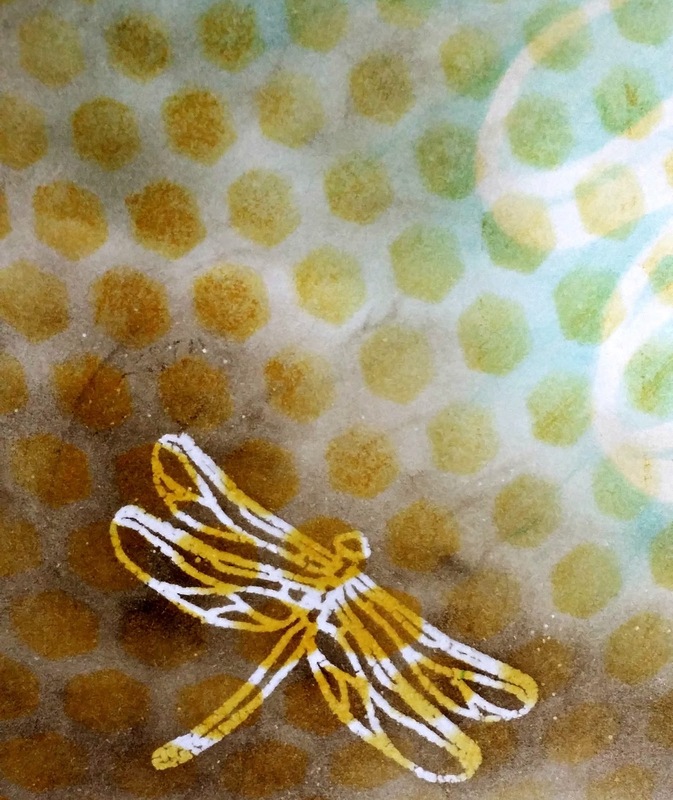 After that all dried, I used an iron and some paper towels to lift off the embossing. I loved the finished sheet so much I didn't have the heart to cut it up. So I didn't! I made a folding card using the whole sheet! Go to this tutorial to see how to score and fold this card. The green belly band ribbon is from the kit. The stamped image is Club Scrap unmounted rubber -also from this kit. 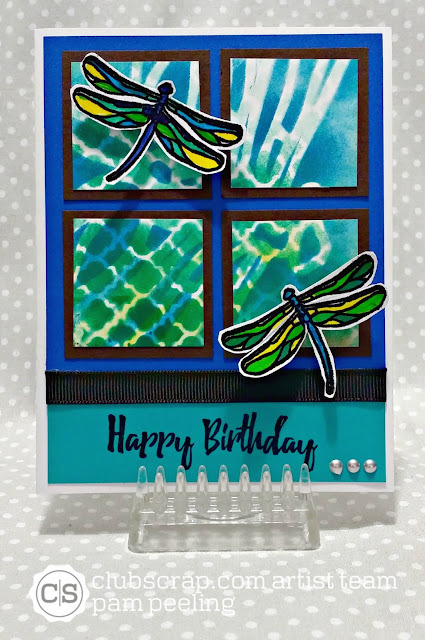 I used black embossing powder ans colored it in with an aqua painter and stamp pad inks. 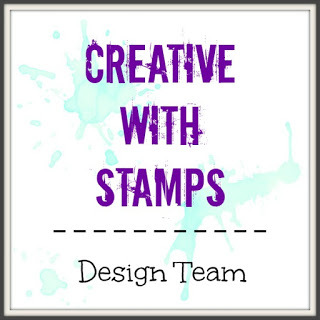 I added a few stamped images and some embellishments to finish off the card. It folds up into a 6" x 6" card. Since this attempt came out so much better I decided to try again! I used basically the same technique except I didn't stamp or use the embossing powder. 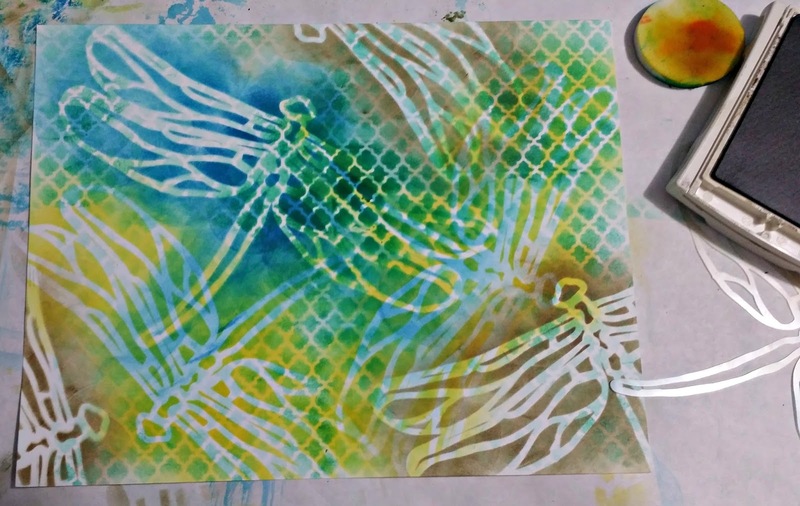 I just used a background stencil and the dragonfly mask. I think I like this one better than the 1st!! 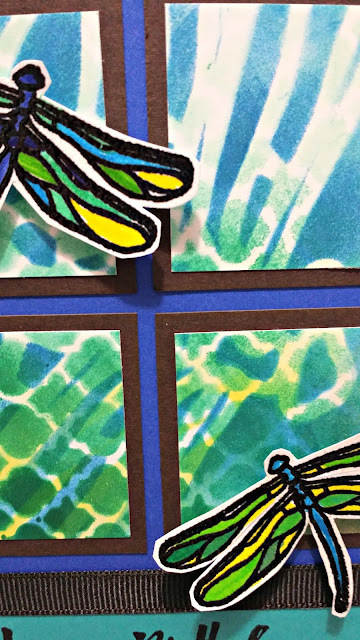 I used embossing powder on the dragonflies again and colored them in with markers for rich bold colors. I really LOVE those dragonflies! So take it from me-if you try a new technique and it doesn't work the way you thought it would and you get frustrated...take a break and TRY AGAIN!!! It just might work out fabulously! So keep right on hopping over to Hetty's blog! I'm sure she's made something amazing! I love everything but the card with the bold colors is outstanding! Both of your papers rocked. I wouldn't have wanted to cut it up either! LOVE what you did with the stencils/masks. All of your cards turned out great! Absolutely Beautiful! I wish I had tried the stencil /mask, that is so neat!!! Beautiful job on all! I'm glad you didn't give up. These are AWESOME! 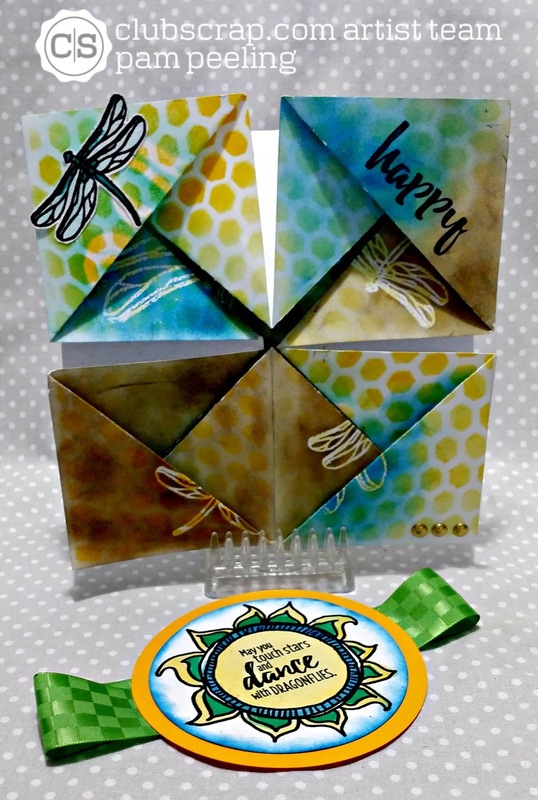 Loving how you made the paper background and that folded card is totally AWESOME! I'm with Hetty on the comment about your 12x12 card..................how very cool! Totally original how you used the 12x12 paper for your card. Love them all! Cute! I love that mask!